The Deeping Secrets is the second book in the Paradise Barn series. The book is just as good as the first in the series drawing you in from the first page and keeping you hooked right through the end. As I said from the very start of this book you are hooked. 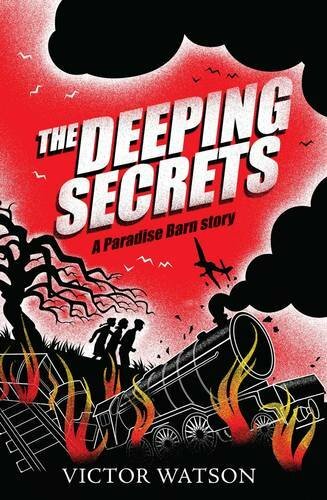 In the first chapter a train just coming into Deeping is bombed with the young characters caught in the middle narrowly escaping injury themselves. The story itself is a pleasant read. You get back to spending time with the characters you know and love from book one Abigail, Molly and Adam and meet new additions Joe and Edmund. I personally loved little Edmund, he is one of those children you want to take home, shelter from all the bad things in the world and feed chocolate cake to. I loved seeing how the friendships established in the book helped to bring him out of himself and change his little life for the better. The final section of the story is where all the differing mysteries of the book are resolved and revealed. Again this was done in a really exciting and engaging way (especially the dramatic scenes on the train) which all added to making this book a wonderful read. Certainly a book I would recommend both as an avid reader myself and as a history teacher. It strikes a nice balance between telling an engaging tale and keeping that story realistic to the time period in which it was set without overburdening the reader with tiny details that can slow the pace of a book and make it dull.